The Acting Director of the FBI, Andrew McCabe, testified before the Senate Intelligence Committee on Thursday in a hearing on "World Wide Threats." He rebuked the White House's claim that President Donald Trump had fired FBI Director James Comey at least partly because the FBI's rank and file "had lost confidence in their director." "In your opinion, is it accurate that the [FBI] rank and file no longer supported Director Comey?" Democratic Sen. Heinrich asked McCabe on Thursday. "No, sir, that is not accurate," McCabe replied. White House Deputy Press Secretary Sarah Huckabee Sanders had told reporters on Wednesday that the White House had "heard from countless members of the FBI" that they had lost confidence in Comey. "In fact, the President will be meeting with Acting Director McCabe later today to discuss that very thing — the morale at the FBI — as well as make an offer to go directly to the FBI if he feels that that's necessary and appropriate." McCabe categorically rebuked that assessment on Thursday. "Working with Director Comey was the honor of my life...I can confidently tell you that the vast majority of FBI employees enjoyed a deep and positive relationship with Director Comey." The hearing featured testimony from six witness, including Director of National Intelligence Dan Coats, CIA Director Mike Pompeo, and NSA Director Adm. Mike Rogers. They were asked to provide a "c omprehensive overview of the current and projected national security threats to the United States and our national interests." The hearing came amid drama over Trump's firing of Comey, however, which made McCabe the FBI's acting director — and the Senate's star witness. "Mr. McCabe: While we don't know how long you will be acting as FBI Director, my first questions for you, even in this public setting, will be for you to assure the Committee that if you come under any political influence from the White House or others to squash this investigation, or impede it in any way, that you will let this Committee know," Democratic Sen. Mark Warner, the vice chairman of the committee, said in his opening statement. Warner condemned Comey's "shocking" firing, the timing of which he called "especially troubling." "He was leading an active counterintelligence investigation into any links between the Trump campaign and the Russian government or its representatives, and whether there was any coordination between the campaign and Russia's efforts to interfere in our election," Warner said. "For many people, including myself, it is hard to avoid the conclusion that the President's decision to remove Director Comey was related to this investigation. And that is unacceptable." Trump wrote a letter to Comey on Tuesday informing him that he was fired, noting in the second paragraph that he "greatly appreciate[s] you informing me, on three separate occasions, that I am not under investigation." Republican Sen. Richard Burr, the committee's chairman, asked McCabe if he ever heard Comey tell Trump that he "was not the subject of an investigation." McCabe replied that he "can't comment on any coversations the director may have had with the president." Warner then asked McCabe if, in light of Comey's dismissal, he will "commit to informing this committee of any effort by the White House to intefere" in the FBI's investigation into Russia's election meddling and whether the Trump campaign was involved. "I absolutely do," McCabe replied. 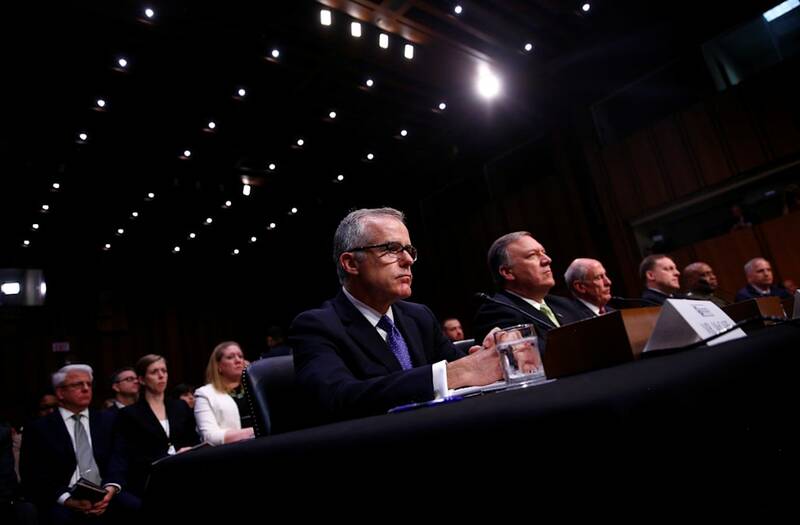 "There has been no effort to impede our investigation today," McCabe said in response to a question from Sen. Marco Rubio. "You cannot stop the men and women of the FBI" from doing their jobs. Democratic Sen. Ron Wyden said that while he disagreed with some of Comey's decisions, "the timing of this firing is wrong to anyone with a semblance of ethics. Director Comey should be here this morning testifying to the American people about where the investigation stands." Wyden said that Trump "encouraged the Russians to attack our democracy" when he asked Russia to find Clinton's "missing emails" last summer. "Would it have been wrong for the director to inform [Trump] he was not under investigation?" Wyden asked McCabe. "I will not comment on whether or not the director and the president had that kind of conversation," McCabe said. He added, however, that he will refrain from providing Trump with updates about the bureau's Russia investigation. Wyden then asked CIA Director Mike Pompeo if he was "aware" of the concerns about former national security adviser Michael Flynn's conversations with Russia's ambassador, Sergey Kislyak. Pompeo said he has "no firsthand information" with respect to the warning former Acting Attorney General Sally Yates gave to the White House in January about Fynn's susceptibility to Russian blackmail. "Is it your experience that people" who haven't done anything wrong need "assurance that they're not under investigation?" Sen. Heinrich asked McCabe, referring to Trump's letter to Comey. "No, sir," McCabe replied. Heinrich then asked if anyone at the White House had asked McCabe about the Russia investigation. McCabe replied that they had not. McCabe added that he believes "we have the adequate resources" needed to complete the Russia investigation, which he referred to as a "highly significant" probe. "We believe it is adequately resourced," McCabe said later, in response to questions from Republican Sen. Lankford. "The investigation will move forward...the FBI will continue to pursue this investigation vigorously and completely."